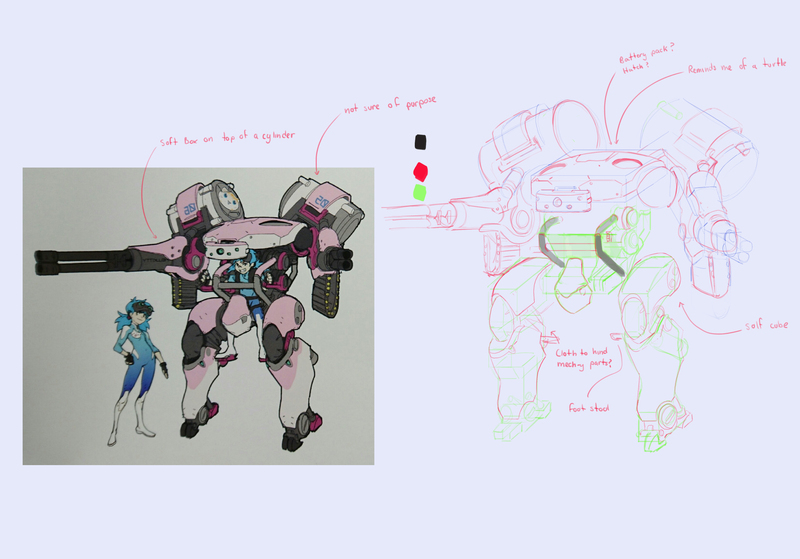 A study on an early d'va concept(one of my favorite heroes) I believe these are from Arnold Tsang. I'll double check at a later time. Breaking down the primitive shapes and some notes to hopefully help me remember things. Not sure what the sitting area part would be called. Wait? That's early symmetra? She looks awesoooome. We need that concept either as a new character or as a skin! But hey really happy to see you working hard. I'm glad that you're posting the studies aswell, they're really interesting to say the least :). And i feel like you're doing great, i love how you're keeping notes. That's some real studing. Now, since you said you were studing proportions and anatomy , my feedback would be to start pushing the latter a little bit more. So when you've studied your proportions and you have your naked figure drawn, i'd suggest picking up an anatomy book and defining the muscles. I made some quick adjasments to show you what i mean a little bit better. You usually wouldnt want your females to look so muscular and defined as this doesnt look very feminine. However it's good for practise. Getting good at real anatomy will not only help you draw stylized stuff easier but it will also help you understand why they are stylized the way they are. That been said, i'm pretty sure you already have a really solid grasp of anatomy, seeing as everything looks pretty spot on. I barely had to add some details to the legs. Finally for the early symmetra's head study i'd suggest trying to get a bit more confident with your lines. So when you draw one and you're not happy with it avoid tracing over it. Just erase it and redraw it. That way you will avoid those scratchy/straw like lines while also getting a lot better and drawing clean, confident ones. Really really good job overall, can't wait to see more! :D.
Thanks a lot for the feedback. Funny thing is that whenever I do my own characters, I always draw in the anatomy before adding in clothes. It was a tip from Marc as well. It funny how both of you guys gave me the same tip. I should do it for these studies as well. Thanks for reminding me. It's an awesome way of remembering anatomy. I'll definitely be using that line confidence tip. I did it a little in the sombra sketch but I honestly need to build up my confidence a lot lot more. For the shadow on the leg, I was copying the shadow from the concept. I shouldn't have done that. Thanks for pointing that out. I should have shaded as it is without the clothing. Again thanks a lot for the feedback and draw over. Lastly, there is so much more you haven't seen yet. The full body version of the early symmetra looks really badass. A study of that will be coming soon. haha really glad for that. I can get a glimpse of the new artbook through your studies :)! Anyway here's the early symmetra concpet Study I promised. Took @Firathion advice and tried to have more confidence in my line work. 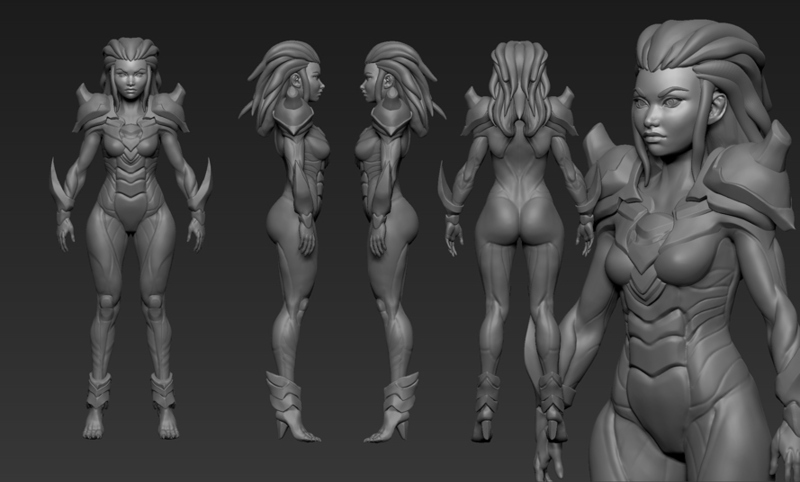 I got a little close to the concept by Arnold Tsang, but, the chest seems way more pushed out I think. Similar to super hero characters I believe. The anatomy is bugging me here. Feedback always welcomed. I think I made a better face from last time but there's still work to be done. Testing knowledge so far. Don;t pay attention to the design so much. You improved a lot since last year! @haith92 yeah bro you should. I stopped doing studies like this for too long. Now there helping a ton. @veek91 thanks a lot. It's been a long but fun journey an it continues everyday. Some sketches before I stuff myself with food tomorrow. Update on this character. I haven't had much time to work on this. Hopefully I finish it before the end of the year. There's a lot of things that still bother me. Feedback always welcomed. Yo, good job with that character, but I've observed a thing or two about it that might help you make it better. First of all, you need to break the symmetry. Add some design elements, like soldier's 76 eye-visor, or different sized or designed shoulder pads, or bracers, or all of it. Also, hair and eyebrows are never symmetrical. Slight change in shape of eyes wouldnt hurt either. Also, eventho I like your lines in the abdomen area, they could use more pop and be slightly more interesting as I will show on my sloppy overpaint later. Speaking about abdomen area, those plates seems to have slight inconsistency with its edges (look for yellow on the pic) You gotta have them all either sharp or smooth. Try to use orb_cracks instead of dem_standard for a change and see how it goes. The design on the shoulderpads doesnt fall into a straight line from the side perspective, you can fix it quite easily with a move brush of a big size, and it will feel much better. Also mechanical bits around her ankle could use some cleaning, do it with either clip or trim brushes (those you get if you press ctrl+shift and go into brush selection) or do retopo with creasing. Also foot could use some work to make it look like it distributes weight properly. Some goes on her high heels (which should be flat btw, because you wouldnt want to penetrate soft surface under your leg and stick an inch or two deep in soil whenever you walk). But most of the weight goes to the point between metatarsals and phalanges, where you have a fat pad or something. The big finger "looks" almost up, the pinky "looks down", while the rest of em somewhere in between, making a nice curve. Eventho she has non-human legs, but making her fingers have human-like angles to them would make it much more appealing. Thanks a bunch for the feedback. I'll try to find ways to break symmetry for the face. I was following my concept heavily. 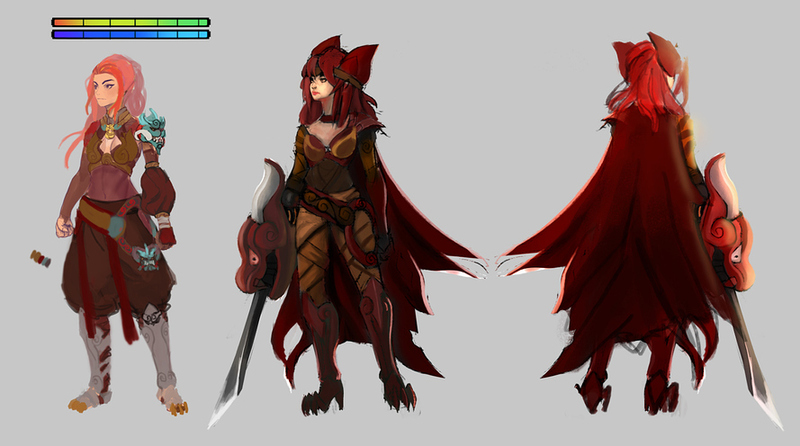 Seeing as the concept is from me and old, I can make some changes if it'll make the end result cooler. I already made a few. I forgot to fix the abs area. Thanks for point that out. I'll definitely try out the orb_cracks brush. For the ankle bits, I just redid them in maya. It was too hard for me to get the clip brushes to work well for me. So a quick blockout in maya was enough. I felt something was wrong with the foot but couldn't put my finger on it. I'll aim to make those changes once I start working on it again today. 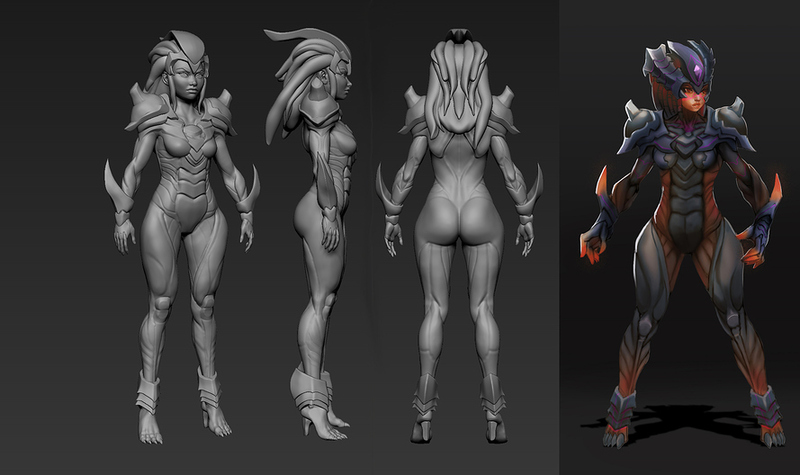 Here's the wip model compared to the concept so far. 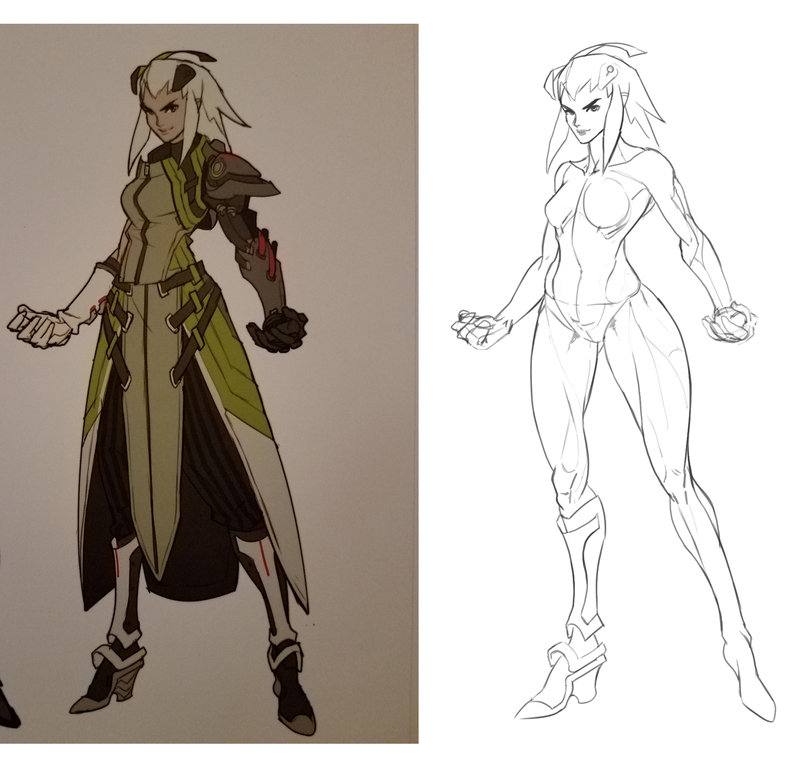 Concept art kills it! 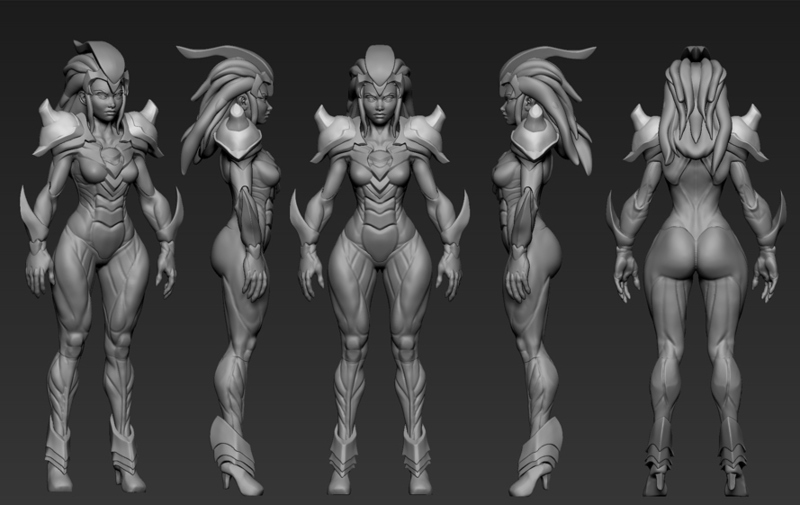 But proportions are little bit too realistic, make it heroic like on your original design. Also pop your volumes little bit more and make actual changes in planes, instead of just lines. It is unlisted on youtube. Also there's an example usage of orb_cracks to make said change in planes really pop. Thanks a bunch for this. Wasn't expecting a video critique. I really appreciate you taking the time do one. Lots of cool tips and the orb_cracks brush demo was awesome. I'll work on those changes as soon as I can. Things like the feet and the ankle protector things I was considering changing. Time for feet revision 6. I'll work on the proportions as well. I think the problem lied with me following realistic anatomy more than my concept. And if you want to see the back view heres a link. 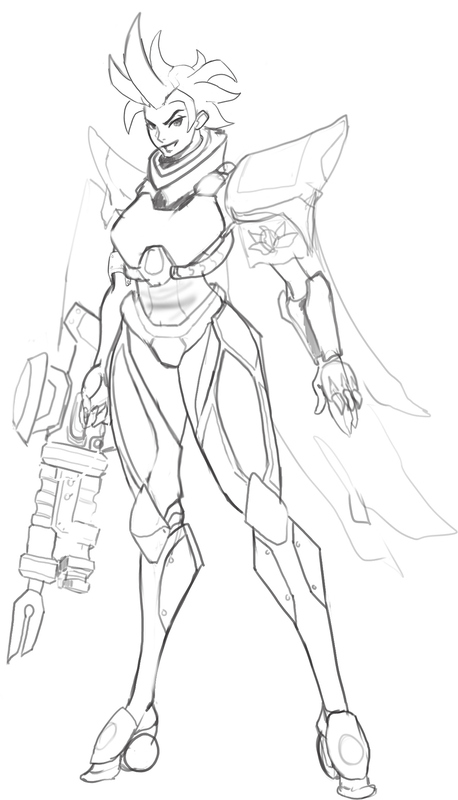 By the way, for the hard edge piece in between the chest, I think I couldn't make it 1 to 1 to the concept so I was trying to figure out something else that I could do there. But your right, its kinda wobbly. I'll try to fix that as well. Again thanks a lot for the feedback. Not sure of timestamps work on here, in case they dont, go to 24:30 and watch until 26 minutes. Also, remember to work on the dynamesh resolution, that would keep your creases with orb cracks or dem_standard well visible, but would allow you to wipe all the surface details easily using smooth. At least, until all shapes are final. Also it would be great, if you could break your model little bit more into different subtools, it would give you this change in planes for free and allow you to work on your edges way easier. Anyway, looking forward for updates! Again thanks a bunch for this. The timestamp worked. 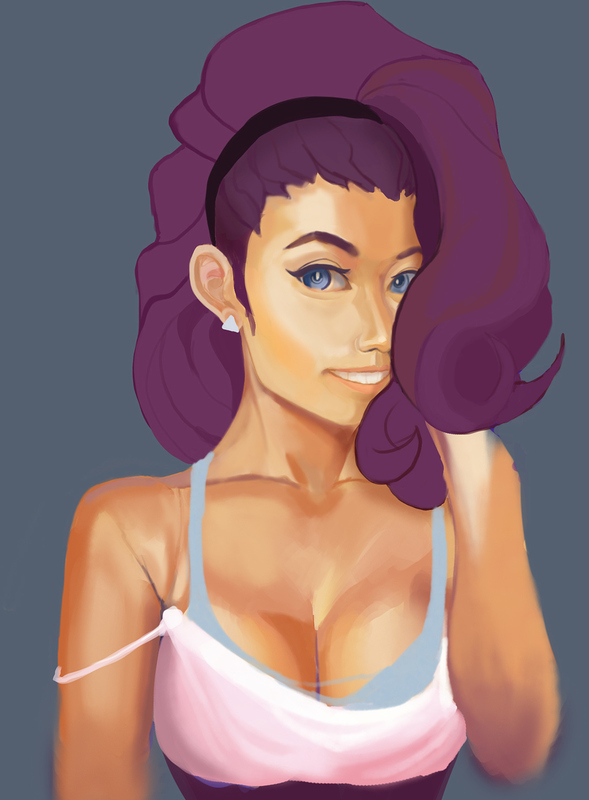 I'll try to capture the subtle areas more as I work on it. More to be done but i'll be following your feedback. Still some things to adjust. 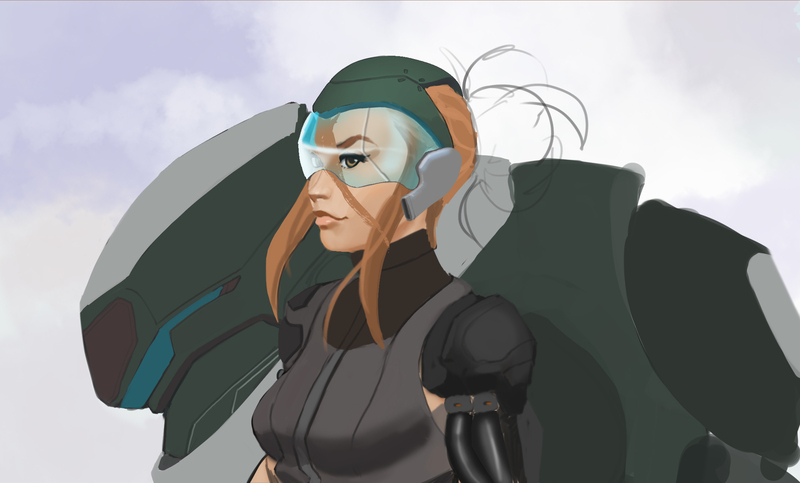 Been a few days since I uploaded anything so here's a early wip of a character i'm reworking. It's the same one from my profile pic on here. This is really early in development. Making an RPG character. Trying out a different process that will hopefully speed me up. Spent a few hours on this. 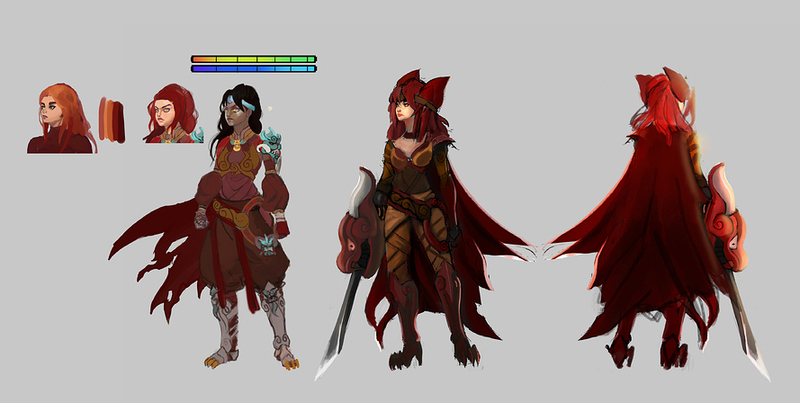 Changed the skin tone and rendered it more so I have a better idea of who the character is. I will probably spend some time on other variations of the design before I settle. I also need to make a weapon design.